Trumpet players. You gotta love 'em... especially since it's illegal to kill them. Pictured here are a couple of the rare, tolerable ones. 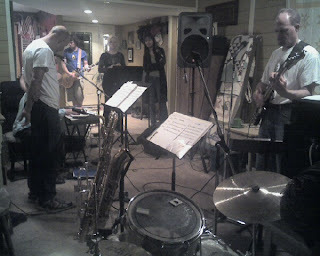 Taken tonight at rehearsal; that's Ron Sewer on the left, and Kendall Wallace on the right. And yes, I know I missed a couple days' pictures. I'm make 'em up, I guess. Sorry mom. Two of them, anyway--these are the alto and the tenor. 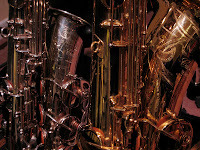 I was kinda hunting around for something to shoot, and since these are usually close by and since I really like the way saxophones look, here they are. The shot is underexposed, but my strobe aren't working and I haven't had time to get them fixed, dangit. If you're a sax geek, here's what you're looking at: The one on the right is my Yamaha Custom 875 tenor, which I'm just back to playing more of lately. 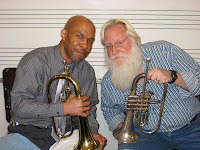 The horn on the left is my Yamaha 82 Custom "Z" alto, and yes, it's in silver plate. I use a copper Phil Barone neck on that horn, which makes it look a little odd but boy--it sure does play. This toy will help you get over all that saccharine cuteness I posted on Thursday. And yes, I know I have a twisted sense of humor. My mother just told me. One of the cooler things I get to do as a musician involves playing in elementary schools with the Burbank Community Band. This photo was from this morning's concert (I'm in the back row of the flute section) at a nearby magnet school. The band is an all-volunteer group, and we do this about once every month or two on Friday mornings. It's fun to see how the kids get totally into the music and the instruments--especially the big ones, like the tubas. With the current budget crisis, the teachers and administrators are especially glad to have us out on campus, as funding for performing arts has all but dried up. Remember to support the arts in YOUR community! 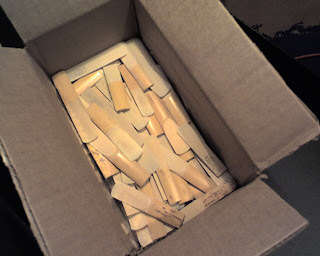 What do you do for your loyal blog readers when you're posting two days' worth of pictures late? Give them baby animals. Can't miss. So Thursday after class, I took a stroll down to "Ag Valley" and said hello to some of our newest residents. This little guy was absolutely charming. 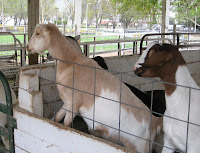 Anyone who knows goats knows they like to climb stuff. This tyke was getting his practice by climbing... his mom. He was pretty good at balancing there, too. 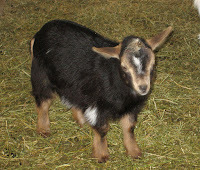 The other thing goats like to do is play. These youngsters were jousting at the back of the pen. It was close to dinnertime when I was out there, and although the goats were curious and friendly, it wasn't surprising that the guy with the chow wagon was WAY more popular with them than I was. Finally, here's a species I didn't know we had on campus. 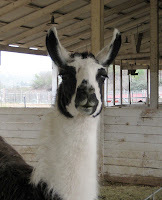 This pair of llamas had a baby in the stall, and boy... they look just like teddy bears with long necks. Funny and irresistible. For those who didn't get to see the lunar eclipse, now you can... sort of. 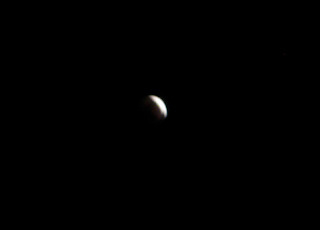 I think what was really eclipsed was my ability to take a decent shot of this, at least with no advance preparation. With a an SLR, a tripod and a long lens, it might have worked. With the PowerShot, you get... um... the general idea, anyway. I'm a little late posting this, but what the heck. 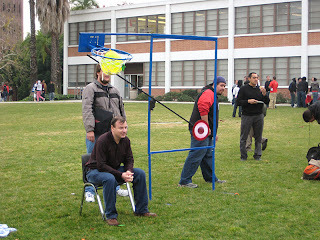 The engineering student clubs were having a noon fair yesterday, and I snapped this picture of the "Dunk Your Professor" booth on my way to my office. It's probably a good thing the business students haven't caught on to this yet, because it was NOT a warm day and I'm not sure I could be as good a sport as this professor obviously was. So it looks like I'm switching over the the "to Hell with lame notions of artistic purity--I'll use whatever camera I want" mode on my Pics of the Day. That doesn't keep me from wondering what the heck I'm going to shoot come 11pm, but it does give me the option of trying something weird, hence the attached photo. 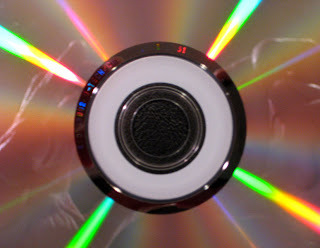 I often catch myself staring into the prisms on CDs, and when I saw an old one in the trash can (can't we recycle these things yet?) I wondered what the camera would do with that kind of surface. Well, it won't take a super-sharp pic, but it did strike me as moderately interesting, so here it is. EXIF data, for those who care about such things, are 1/8 sec @ f/4.5, ISO 200, no flash. Well, my little project (or resolution, or whatever it is) has turned out to be at least a little frustrating. 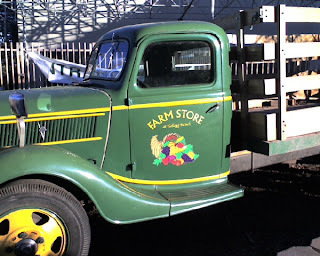 To recap, my original intention was to take and post a photo each day from my cell phone. The idea was to make this sort of a photo-autobiography in the sense that these would be images from my environment. The problem, unfortunately, has been that my cellphone camera seems to be very limited in what sort of conditions it can get a decent (by my standards) photo. While this photo isn't perfect, it does reveal the limitations in my original cellphone photo. The hues are more accurate, and whites appear to be rendered a little more nicely. I get the opposite problem with low-light photos: I don't know if any cellphones include a flash, since (I would think, anyway) that would be a HUGE drain on the battery, so the camera's software has to compensate by increasing the exposure time (leading to blurs), or the ISO (which gives you graininess). Argh. Eeek! Bones! A little backyard paleontology here... we've been taking out a deck that's falling apart in places and needs to be replaced with a small garage-type building. While pulling up some supports, I spotted these bones and thought I'd share them. My guess is they're rat bones (and yes, mom... I washed my hands afterwards), but I'm surprised I found them before the dogs did. This image was also useful, since it helped me discover that you can actually take something approaching a macro photo using a little point-and-shoot. Just zoom way out, back up a foot or two (like you would if you're doing this with an SLR and a long lens), and take several shots so that you've got a decent chance of getting the focus right. Cool. Pic of the day: Rotate! The weather was pretty nice today, so I took the scooter down the Olive Recreation Center to get this pic. 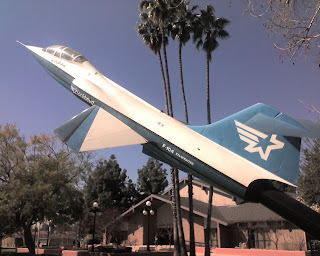 Burbank was home to Lockheed for many years, and the community still exhibits strong emotional ties to that part of its history. This F-104 Starfighter is one of the many artifacts of this relationship, and makes a terrific sentinel at the building entrance. Fun on eBay: That's a WHAT?!?! A forum friend posted a link tonight to a current eBay auction for an "Excellent Baritone Saxophone." I was by now familiar with this particular breed of auctioneer, but morbid curiosity drove me to have a look. I wasn't disappointed. Hello! Welcome to my shop. I am a musical instrument dealer, the management GuZhen, Saxophone, violin, ErHu, the bottle gourd silk, guitar, lute, Mandolin, flute, tuba, about several 100 species can provide you choice! Please first look the photos, Its texture is very well. Look at the pictures you can see the shape is very well . So wonderful item . please don't miss it ! It is most valued. It will bring good luck for you, I believe you are a very standout buyer. If you know the value of my item. Please bid my item. I have many other wonderful collect item on me store. Please view my other items . If you need please send E-mail to me.If you be music fancier, the chance to of the so better of the not miss of the please do get it. Enjoying your bidding!!! The photo, of course, is the kicker. It's the tiniest baritone saxophone I've ever seen. In fact, I'd bet it's pitched in Bb looks/sounds every bit like a soprano, but you just never know about these eBay guys... perhaps this is the pocket bari we've all secretly been hoping for. Not sure how (or if) one of these horns would play, but in the interest of fairness, I'll post a link to the seller's current auctions, just in case anyone wants to give one a try. Even if you don't want to shop, I'm sure they'll make for amusing reading. 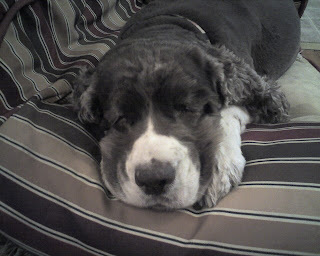 For those who haven't met her, this is Punky, my evil little Monsterdog. Punky has no eyes, so it's sometimes difficult to tell if she's sleeping. In general, though, I know that if she's standing, she's probably awake. If she's snoring, she's either asleep or ignoring me. Pic of the day: Bzzzzzz! 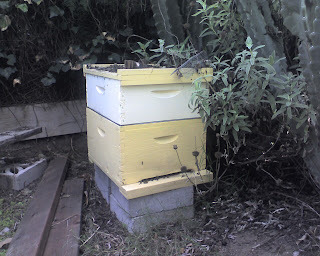 Growing up, we always had a hive on the yard, since my dad was a beekeeper as sort of a hobby/obsession. He'd harvest the honey and put it in jars, and we'd sell it in a little stand at the curb after school. Decades later, I ended up with a bunch of bees living under a deck in the backyard, but there was no way to save the colony at the time. But dad had an old box around, so after I'd bugged him enough, he brought over this colony and they've been living here ever since. The plants LOVE these guys, and they've been busy, so I'm gonna have to get in there soon to add another level to the hive. 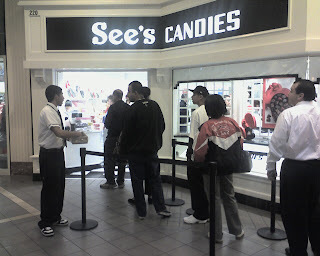 It's the day before V-Day, which means that a few women and most men are at the mall right this minute, procuring an expression of their love... or whatever. This particular shop was packed. Dungeon? Haunted house? Nope, this is just the hallway in the auditorium building of our local community college. 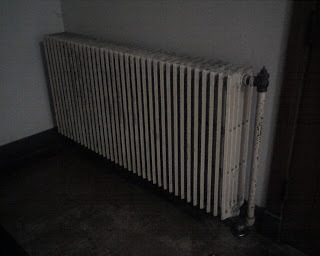 I don't know why this grizzled old radiator remains, or why it was located inches from an exterior door in the first place, but I do like the creepiness of the scene. Boo! Buddies who like to play. Or musicians you like to hang with... whichever. Regardless, if you play in a cover band, you HAVE to like the guys you're playing with, cause you're not gonna get rich at it. Just like jazz, in fact. I didn't realize that a normal person might not realize what I'm referring to when I use this term, so here's a shot of my "woodshed," which is the place where a musician goes to practice. In the foreground is a music stand with the exercise book I'm working on. The computer gives me something to do when my chops need a break. 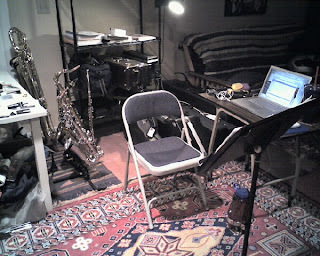 Behind the chair are alto, tenor, and bari saxes, as well as flute and clarinet. The only thing missing is me, so better get back to it! 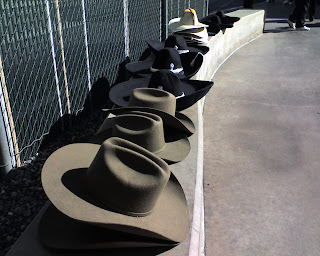 Played at Carnation Corner today, and on the way out through the back lot I spotted this row of hats, waiting to join their owners for a ballet folklorico. 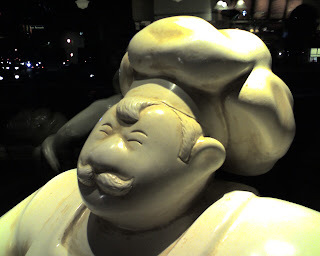 This guy guards the door at the Corner Bakery Cafe. I'm kinda surprised the camera could handle the lighting here. Cool. I had hoped I would end up with another image Thursday, but this was all I had time for. 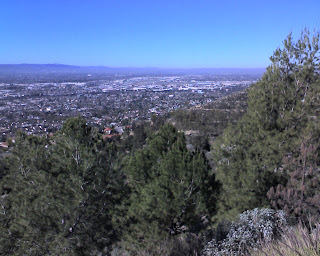 This is the view of the San Fernando Valley from the hills near home. Burbank airport is in the distance (hope it's visible). Pic of the day: Black hole? A warp in the space-time continuum? 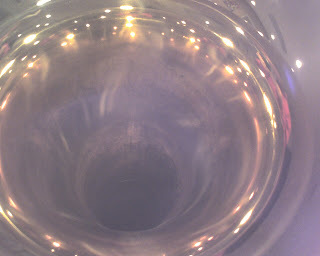 No... just a peek inside a Gronitz F tuba. Probably just as dangerous, though. In order to keep this latest blog from falling into disuse like my others have, I hereby resolve to put up a picture every day for the rest of the month of February. Each picture will be taken with my cellphone's camera and posted from the same. That forces me to work within its limitations (nearly square dimensions, no zoom and little tolerance for challenging lighting), and will also tend to favor images from my normal environment, since, after all... who wants to make a special trip just to take a cellphone pic? And yes, I know we're already five days into February. It gives my limited attention span a good head start. Saw these cats a couple of weeks ago, when they were about nine shows into a 50-city tour. The group is loosely headed-up by pianist Benny Green, but it represents a terrific mix of talent that spans at least three generations. With Green is James Moody on Sax and flute, Terence Blanchard on trumpet, Kendrick Scott on drums, and Derrick Hodge on bass. Nnenna Freelon joined the group on several vocal numbers, one of which was a duet of "Just Squeeze Me" with Moody (I must live in a cave, since I didn't know he sang), and the other a *very* hip reharmonized version of "Time After Time." The evening wasn't all standards, though... the band also played a couple selections from Terence Blanchard's recent release, "A Tale of God's Will (A requiem for Katrina)". Compositions by drummer Kendrick Scott and bassist Derrick Hodge were also prominently featured. Catch this group if they come to your neck of the woods. Tickets and a complete list of dates are available at the MJF website here. You can also buy their live CD from Concord Music Group here.